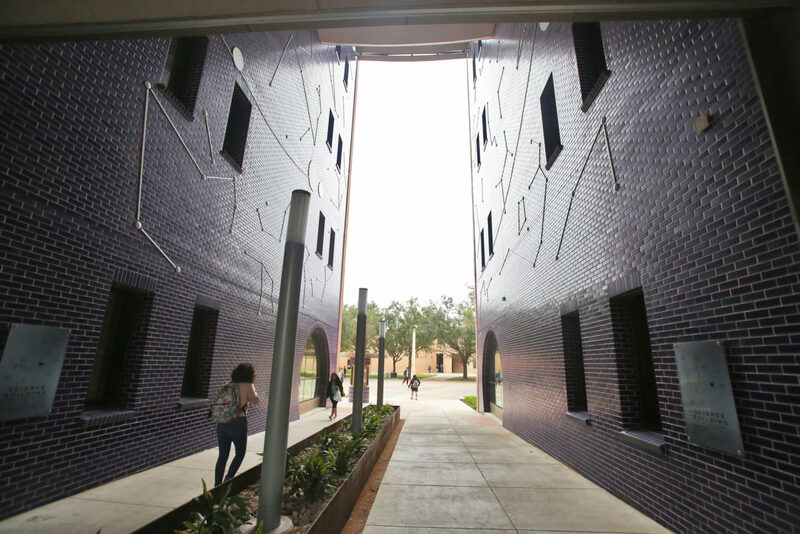 EDINBURG — Two giant star alignment layouts greet students as they walk into the courtyard of the new Science Building at the University of Texas Rio Grande Valley on their first day back to school. On the wall to the right is the night sky of when construction of the building was finalized, May 1, 2018. To the left is the night sky of when the university was established, June 14, 2013. 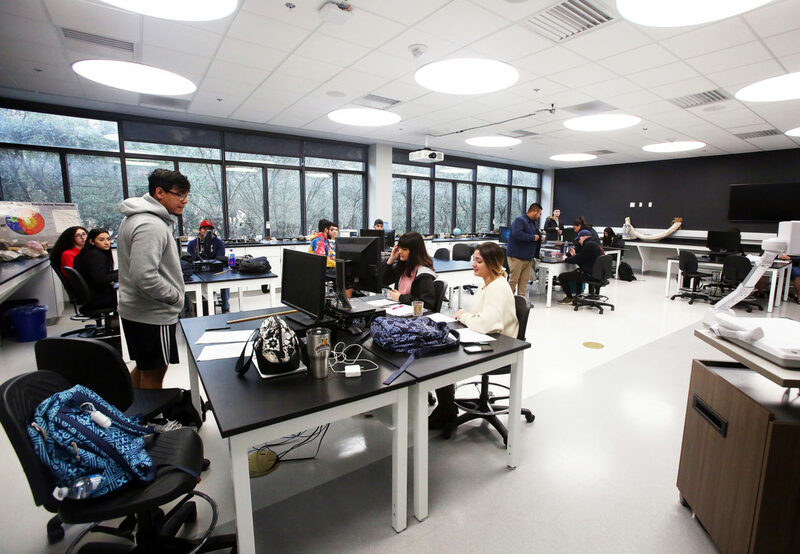 The new 111,882-square-foot building was officially inaugurated this spring, but began accommodating students in some areas since fall 2018. And along with the inauguration, university officials also celebrated the new Music, Science and Learning Center in Brownsville. The two buildings not only represent growth, but the first two construction projects funded with Permanent University Funds. Access to these funds was not available before the creation of UTRGV. The new building now merges old with new. The original science wing was built in the 1990s and is now only one part of what encloses a courtyard, connecting it to the new wing of the building, which completely surrounds the yard. The building’s focus was to have competitive research space — catering to the changing needs of students with new technology and larger work areas — and remaining competitive to attract students and faculty. “We should be able to provide students with space that they can’t only use, but that it’s competitive and new,” said Juan Ortiz, UTRGV’s facilities project manager while leading a tour of the new Edinburg campus building. One of the institution’s main goals is to attain the Emerging Research status, which would allow the university to gain access to funding specifically dedicated to universities with this distinction. The four-story building came at a total cost of $72,118,137 and has17 research labs, four teaching labs, three general classrooms, 43 faculty and staff offices, two research assistant suites, and plenty of conference rooms for students and staff to work in, as well as open study areas. In Brownsville, the Music, Science and Learning Center measures 102,552 square-feet and consists of two, three-story wings that also enclose a courtyard. The building has a mixture of teaching labs, music instruction classrooms, and music recital spaces, as well as open study spaces and conference rooms for students and staff. 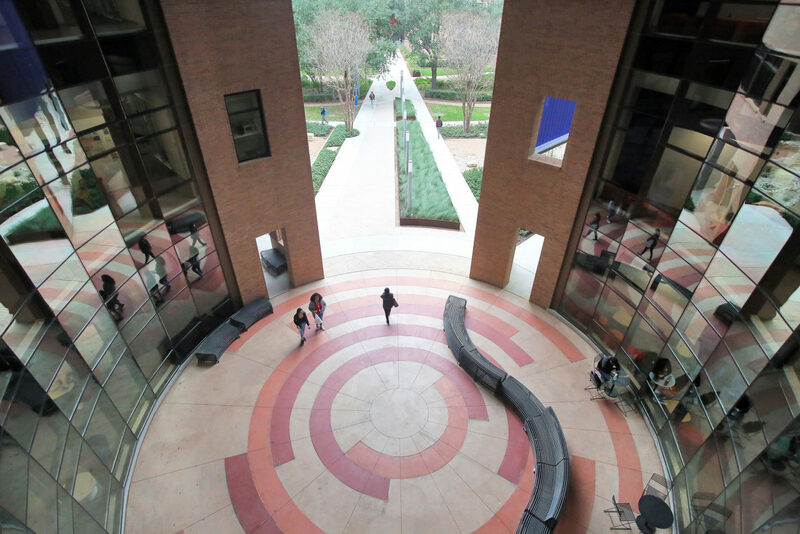 Because of the distance between the two campuses and other teaching centers, UTRGV officials equipped every building with the capabilities to connect distance learning equipment, such as video conferencing cameras and televisions. Before planning for the added science spaces, UTRGV’s growth in the STEM fields had already began. Bailey said these spaces became the focus of immediate construction. 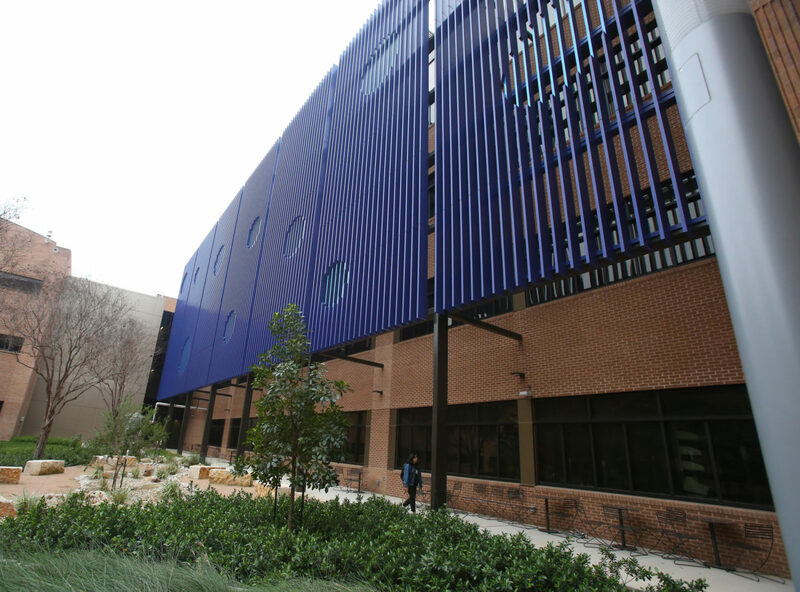 The university also recently completed another building in Edinburg, the Interdisciplinary Engineering & Academic building, and has several projects underway, such as an Interdisciplinary building in Brownsville, a research center in McAllen, and the STARGATE Technology Center in Boca Chica Beach. These and other recent completions have been built with a mixture of funding and partnerships along the way. Coming up for the university, is the expansion of the school of medicine building, for which funding has already been allocated, and a groundbreaking should be coming soon, Bailey said. But still in his wish list is space for the college of health affairs and nursing.